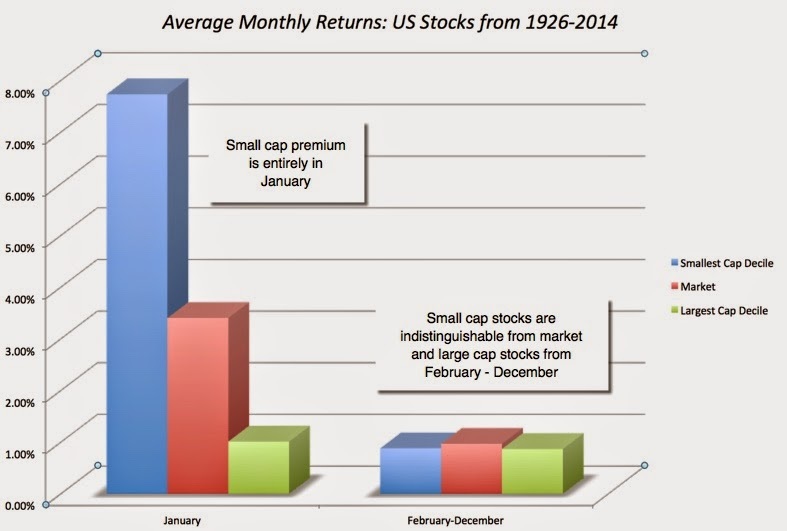 Musings on Markets: The Small Cap Premium: Where is the beef? It's worse when you look at the performance of the most widely used small cap index, the Russell 2000. The R2K has underperformed small caps in general. (Why? Perhaps because membership in a major index grants a stock improved liquidity). expected to outperform the broad market. Further small cap premium would be expected to be significantly positive in bull markets and significantly negative in bear markets, in other words small cap effect is a function of investor sentiment ( risk -on vs. risk off sentiment). 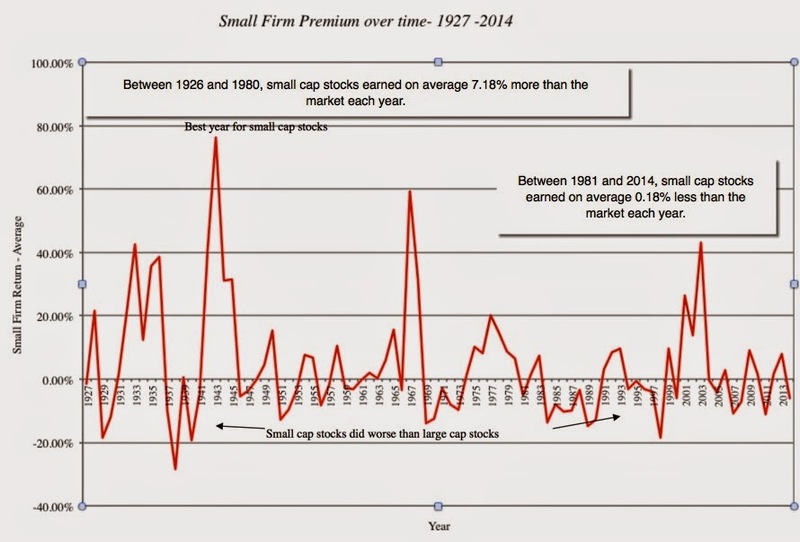 So splitting the sample period (1926-2014) into three periods of bull markets, bear markets and range bound markets would give us some more insights on the small cap premium. Further there is the migration effect i.e. 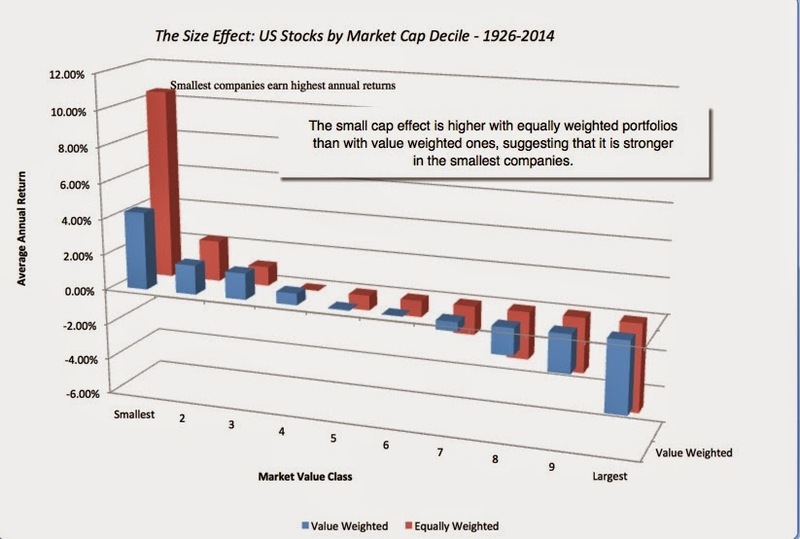 small caps going onto become mid caps due to stock price surge and mid caps becoming small caps due to stock prices plummeting in the preceding years. In other words when we look at decile 10 of the capitalization strata, the character of the firms in the decile 10 is vastly different every year. Further empirical evidence suggests small cap premium is concentrated in few sectors/industries which emerge out of nowhere and become sunrise industries. In other words analyzing small cap effect is vastly complicated and there are too many forces at work! It it takes this much convoluted back tracking for you to try to explain with small cap stocks, there is no small cap effect. It is not complicated. It is just not there. In your calculation of the small cap ERP,shouldn't the terminal growth rate be much higher than the risk free rate. By using the same rate as the S&P 500 you're actually calculating the return on equity of companies that begin as small cap but are treated as large caps after year 5. Wouldn't you want your inputs for calculations beyond year 5 to reflect a constant rate of growth for small caps, which to me is much higher than the risk free rate? You have a good point, though the growth rate you use can only be marginally higher than the growth rate of the economy, since it is a perpetual number. By the take same token, I should probably use a slightly lower than the economy growth rate for larger companies. What if there were an instance where the implied small cap premium were higher than the large cap? Would it be more precise to use the small implied premium? In line with comments from UniverseofRisk, I think the growth assumption, and particularly the assumed growth differential between large and small caps, can easily change your conclusion. Duplicating your math, I can justify a premium of about 1.25% if I assume 10% growth in small caps for 10 years (vice 5), and then capitalize at the risk free rate. This may not justify the 4-5% premium that is ubiquitously applied, but it does highlight that both growth and risk expectations must be considered. Having valued hundreds of small and very small businesses over the years I have never been comfortable imposing substantial small cap premiums when developing my discount rates used in DCF analysis. However, valuators do face real differences when valuing "small" companies (i.e., less than $5 million in annual sales), such as: 1) Investment diversification is rarely achieved where the typical owner owns 100% of the equity; and 2) that ownership comprises a very significant portion of that individual's personal wealth. Given the reality of typically poor diversification in small business valuation, is any premium warranted for the owner's inability to diversify systematic risk? In a significant level of valuation work, a "micro-cap" premium is being applied as those companies are much smaller than a small cap company. In those cases, is it at least marginally reasonable and justifiable to use a micro-cap premium? It is entirely possible that giving a longer growth period for small cap stocks or a slightly higher growth rate in stable growth can yield a small cap premium, but the fact that you have work that hard to get any significance is revealing. The lack of diversification is an entirely different issue and I am not sure why a small cap premium (that comes from publicly traded companies) would yield an answer. I have argued that lack of diversification effectively scales up your exposure to conventional market risk. (I concocted the total beta measure to capture it). I think that the bulk of the premium, if it exists in microcap companies is a reflection of either survival risk or illiquidity and my points about double counting still stand. Thanks for a great piece, Professor. "While 'over estimating' discount rates reduces type 1 errors (that you will buy an over valued stock), it comes at the expense of type 2 errors (that you will hold off on buying an under valued stock)." As a long-only investor, wouldn't it not be okay to commit a few type II errors as a price for incorporating 'margin of safety'? Sure. As long as you don't end up with a lot of cash in your portfolio because you have set your expected return too high (or applied too large a margin of safety in your portfolio). In this market, finding an under valued stock is tough enough. What you are saying is what I found in the 1990s and have consistently asked others about. In a chapter to an update to a valuation text in 1998, Hakala (me) and Bajaj found no forward-looking small stock premium, found small stock premiums largely disappeared after 1980, and found that the small stock premium was highly correlated with the bid-ask spread (transactions cost) which has gone done steadily over time. Additionally, if you look at actual buy and hold small cap fund returns (like Vanguard's NAESX from 1960 onward) or DFSCX since inception, small caps have only slightly outperformed large caps on a geometric return basis by 1.0% since 1960s and microcaps have only slightly outperformed large caps since 1982 by 1.0%. The NAESX has actually underperformed S&P 500 funds since the end of 1986 on a geometric return basis. Thus, much of the findings appear to be data mining and biases (arithmetric annual returns in Ibbotson and Duff & Phelps; monthly average returns in Fama-French work) and to have largely declined to not being statistically significant post 1980. First, the use of arithmetric average returns over relatively short holding periods will mathematically always overstate the correct size premium for a three to five year DCF and for the terminal value discount rate. There have been numerous studies on this in the academic literature that have largely been discounted or ignored (from Blume's work in the 1970s to more recent work by others such as Jacquier's work with Kane and Marcus). Second, the Compustat (and to a much less extent CRSP) data has two biases associated with construction of the combined data: a backfilling bias (as the databases were constructed and filled in over time from the 1970s to current with subsequently successful companies "backfilled" and added to the historical data overtime) and a restatement bias (historic data was restated after mergers or subsequent restatements). There was work done for Compustat on this issue by Northfield around 2000-2001 that found substantially inflated return averages (as much as 6% overstatement of returns in 1980s) using backfilled and restated data as compared with the originally "as reported" data. Compustat now sells a separate set of "corrected, as first reported" financial data that acknowledges this issue. But even the academic studies often do not use this corrected data (because it does not come automatically matched up with the CRSP data, requires a separate purchase, and the data only goes back to 1983). Requiring companies with two or five years of historical trading or financial data is a common "academic" "solution" to the backfilling bias but does not appear to entirely solve the backfilling problem and does not address the significance and importance of restatements in the data (Companies with negative restatements will drop out of the D&P study and companies with positive restatements for mergers and such will suddenly show up in the data, for example.) Despite the academic work going back and forth on this issue, no one has actually studied the true effects of the bias beyond guesses that I know of. Third, microcap stocks are more likely to experience positive jumps in returns due to being acquired/restructured that are not representative of expected returns. These "outliers" have been shown to significantly explain some of the "anomalies" in some of the academic research. At least one could argue this part of the equation has some validity but it is a non-priced excess return on a current basis for most microcaps. In estimating implied ERP for small cap you have used dividend discount model (for stable firms), is this model right in the first place for small companies which are typically 1) growing and 2) not stable? However, I agree with you that small cap premium is actually not warranted since we have to estimate cash flows based on the characteristics of a particular small firm, and discount rate should not capture it. I understand your blog and I agree with your arguments. But is very subjective to adjust the DCF for possible bankruptcy or other adjustments. Why are better or less subjective those adjustment than use a small cap premium? Do you have any longer documents about those topic? If there is no small cap premium, do you see a mid cap premium? Over the long-haul they seem to have had higher returns and are potentially lower risk being larger and more established than their smaller cap counterparts. Thank you for addressing this topic and in advance for consideration of my question. In practice, I have noted that a number of the stocks I am reviewing in the UK that are listed below the FTSE100 have lower equity betas (and asset betas) than direct comparables. How do we adjust for trading volume, at least in the short term, to reflect the lack of liquidity in the specific stocks. Whilst I agree that there is limited logic for a small cap premium, WACCs do appear lower for smaller cap stocks, even when adjusting for the higher marginal after tax cost of debt.